In 2012, Pauline Marois donned a red square and declared the PQ the party of the social left. In 2014, she stood by Pierre-Karl Peladeau and declared the PQ the party of business and the economy. A scant 18 months have gone by. As I’d pointed out at the time, the PQ’s involvement in the red square movement was no accident. Whether you believe it was orchestrated in advance or sheer opportunism or a little of both, Pauline Marois and company knew exactly what they were doing when they put on those red squares and promised the world to the protesting students. As you know, I did not support the red square protests at the time and I still don’t. I think tuition badly needs to unfreeze, and the fact that it’s become such a third rail issue is hurting our education system, our economy and our opportunities for the province’s future. But of course, it was never about that. The protests rapidly changed their tone from the original tuition freeze message to talk about corruption, social issues, anti-protest legislation, and specifically about the Liberals under Jean Charest. To this day, I speak to friends who supported the red square movement who argue that it had nothing to do with PQ versus Liberal. Many of them don’t and won’t vote for the PQ; they’re Quebec Solidaire, Green or even Marxist-Leninist voters, or else they’re utterly disgusted by politics and don’t vote. I don’t doubt that their own personal motivations to be out there banging pots and pans were, in fact, pure. Nobody wants to believe that they’re merely puppets in a larger political game, with someone else pulling the strings. It’s an ugly and insulting accusation to level at people who, I’m sure, had the best of intentions. But the truth is, the students and others who were out there played exactly into the PQ’s hands. The voter turnout among 18-24 year olds is historically low. It was only 36% in 2008, and has hovered in the under 40% range for decades. In 2012, a historically unprecedented 62% of them voted. Similar upswings in participation were noted among the 25-34 age group. It was this huge vote upswing that turfed out the Liberals and put the PQ in power. It was, in effect, a coup d’etat cleverly disguised as a protest movement. And, intentionally or not, the folks out banging on pots and pans became tools of the PQ, who rode the anti-Liberal anger all the way to a narrow minority-government victory. A real feat for a party that had been in complete disarray only twelve months earlier. And anyone who thinks that this happened by accident or happenstance is, excuse me for saying this, but just as naive as the students who believed Pauline Marois when she pinned that red square on her coat in the first place. Flash forward 18 months and that’s all changed. The PQ has taken a hard right turn by recruiting media mogul, businessman and notorious union-buster Pierre-Karl Peladeau to its ranks. It’s a calculated strategy by the PQ, who sees the CAQ collapsing and is going after its voters in the suburbs. However, in the process, the PQ’s traditional staunch allies — labour unions, students, activists, the social left in general, are finally feeling abandoned. 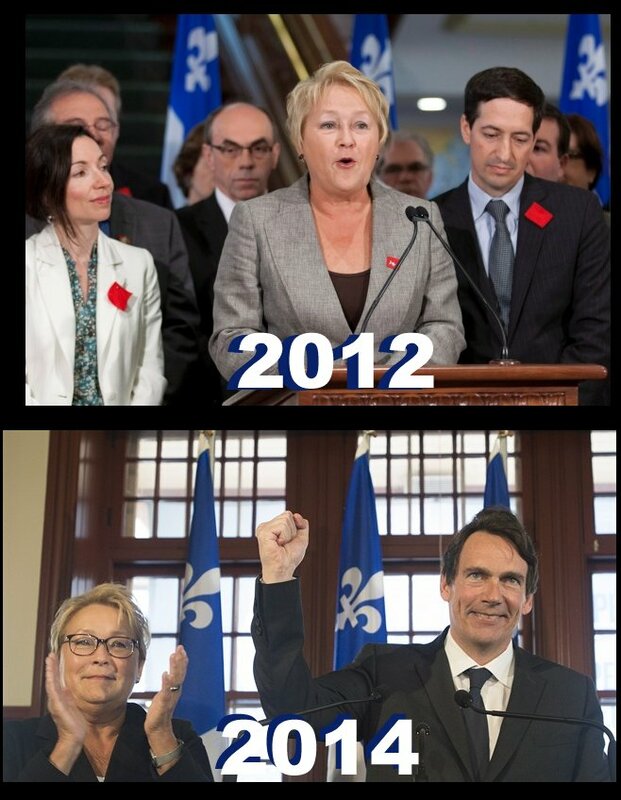 So, not too surprisingly, Marois and her party are resorting to desperation tactics. In 1995, Jacques Parizeau infamously blamed the referendum defeat on “money and the ethnic vote” after accusing immigrants and new Quebecers of having their citizenships fast-tracked to allow them to “steal” the referendum. They also illegally disallowed 86,000 “no” ballots in a desperate attempt to try to steal the referendum for themselves. And now it’s 2014 and we’re seeing the same ugly tactics all over again. Pauline Marois is publicly “worried” that the election will be “stolen” by yet another group of “outsiders” — this time her target is students. Namely, students who moved here from out of province to study, and who are attempting to legally register themselves on the electoral list to exercise their constitutional right to vote. Marois’s concern? 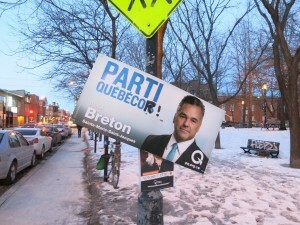 Too many of them have ‘funny-sounding’ English names and are thus unlikely to vote for the PQ. So their attempts to vote are ‘worrisome’. Clearly. Only 18 months ago, students helped Marois coast to victory. This time, she’s desperately hoping that they’ll provide a convenient foil that will help her avoid defeat. After all, if Muslim women in hijabs don’t scare voters enough, maybe students from Ontario will do the trick. The PQ believes they’ve found a way to get scared voters from the regions to turn out in high numbers. They’ve latched onto this issue. The justice minister even weighed in. How ironically symbolic was it to see Leo Bureau-Blouin — one of the student protest leaders — out front at a PQ press conference designed to deny the rights of students to vote. Because Bureau-Blouin and fellow student leader Martine Desjardins, in becoming PQ candidates, showed what most of us knew all along: They were never in it for the students. They were in it for themselves — their own political careers, their own advancement. In the process, they were fully prepared to throw the student members of their unions under the bus, denying them their right to attend classes they paid for or even in some cases, to graduate. And then they threw them under the bus a second time at the PQ’s sham of a student leadership “summit”, at which the PQ proceeded to unfreeze tuition anyway — albeit to a smaller degree than the Liberals had been planning to do, leaving a huge funding gap about which our universities are sounding the alarm. But even so. And the thing is, it turns out that it’s all completely manufactured nonsense. Registrations aren’t unusually high; according to the DG’s office they’re even slightly down from the last election. Students, due to the fact that they move around a lot, are more likely to be trying to register at a new address before an election than older people who have lived in the same place for a long time. The real outrage isn’t that students are trying to register to vote; it’s that anyone is trying to stop them. There are three criteria that have to be met to allow someone to vote in this election. They have to be Canadian citizens, they have to be 18 years or older, and they have to have been ‘domiciled’ in Quebec for a minimum of 6 months. Simple, right? Not so much. Because students are reporting that they’re being denied the right to register to vote by the review boards, after being asked to prove completely arbitrary things, like their intent to remain permanently in Quebec, their taxpayer status or their holding of a driver’s license. Many students don’t pay taxes, since they earn little income. Many students in Montreal don’t drive or own a car. That’s perfectly normal. But the PQ finds it concerning. Why? Because they’re too anglophone? Too ethnic? Too likely to vote for someone other than the PQ who, I might point out, royally screwed over the students last time around? All of the above? The DG’s office released a “clarification” as to what “domiciled” means, which clarified absolutely nothing at all. It basically empowers the DG’s office to conduct an inquisition into all matters of the voter’s life, and then to arbitrarily deny them their right to vote anyway. Anyone who thinks this sounds an awful lot like the Republican Party in the United States would not be wrong. The PQ is doing everything in its power to win this election. Because in their view, this is still about identity. “Nous” — Pequistes — have the right to vote, but “vous autres” — anyone voting for someone else — is an outsider who is stealing Quebec’s right to decide for itself. “Vous autres” includes anyone the PQ deems an outsider, whether because they are immigrants, minorities, students, too anglo, too ethnic, too federalist, anything non-PQ. We all have the right to vote. But in Pauline Marois’ view, the only people who ought to vote are the folks who agree with her. Everyone else be damned. The whole thing is utterly disgusting. I can only hope that any student legally allowed to vote who is denied will appeal, and that other students will go out and vote en masse to turf out the PQ. I hope that they will realize that they were never allies, that the PQ never had their best interests at heart and is only interested in power at all costs. I hope the electorate will be too smart to be played this time. Update: Kelly McParland echoes this sentiment in the National Post: For Marois, the only thing worse than an ethnic voter is a student from Ontario. What’s behind the PQ turmoil? Lying to voters in order to get them to the polls does not constitute a coup d’etat. If it did, then nearly every election win in history would count as a coup d’etat. It was a legal coup d’etat, within the structure of our democratic system. I’m not claiming anyone stormed the National Assembly with guns or anything. But nonetheless, what we saw was a government deliberately stirring up civil unrest to force an early election and a subsequent change of government. Which is exactly what happened. So such thing as a legal coup d’etat. Remember, this is what the Republicans said about both Clinton and Obama. Clinton, especially.